Everyone can put their past behind for a greater cause, like in Rogue One: A Star Wars Story where Jyn Erso, who comes from a checkered past, and K-2SO, a former Imperial security droid, find new purpose when they join the Rebels on a dangerous mission to infiltrate the Empire and steal the secret plans to the Death Star. Hot Toys is happy to bring this endearing duo to its popular line of Star Wars Cosbaby Bobble Head mini figures! 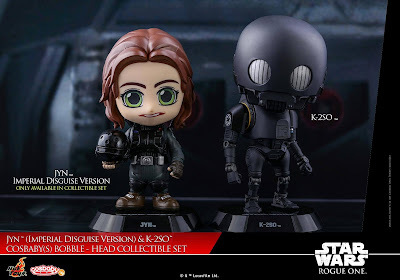 The Star Wars: Rogue One Jyn & K-2SO Cosbaby Set features an “Imperial Disguise” Jyn variant that is only available as part of this set, while the K-2SO will also be available individually. Each figure stands approximately 3.75” tall. Recruit the Rebels for your Rogue One Cosbaby collection today!